Maximum effect – minimal effort. In research and development, every gram of product results in huge costs. Our Mini-Coater lets you produce batches as small as 50 g in a highly efficient way. Feasibility tests – quick and easy. With its three exchangeable drums and special nozzle arrangement, the Mini-Coater is ready to start work immediately. Optional qualification package for clinical samples. All relevant materials are FDA compliant. The inlet air is HEPA filtered. The entire system is qualified. High-quality processing in the very best Glatt tradition, all this at an exceptionally attractive price. Superior coating on a very small scale. Optimal results in minimal time. No time-consuming installation. Robust, reliable technology. The entire housing can be dismantled and reassembled for drum changes or cleaning in a matter of seconds. This is one more simple solution leading to an effortless handling. 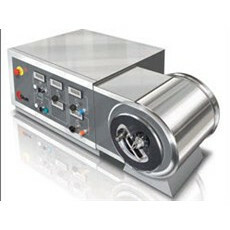 New and used Glatt GMPC I Mini-Coater's for sale on LabX. Purchase and get quotes on the products you need for your lab. Choose from a variety of vendors.